Info "The lonely viking travels the world on his boat. 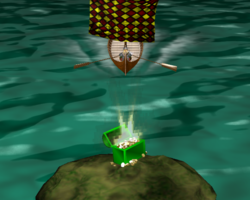 Row the oars with all your might to help him get to the treasure!" Stroke of Genius is one of Orbulon's Microgames in WarioWare: Smooth Moves. The player must stroke with the controllers to paddle towards the island. The left controller makes the boat go right, and vice-versa. 1st level difficulty: The island is directly ahead. 2nd level difficulty: The island is slightly to the side. 3rd level difficulty: The island is out of the way. This page was last edited on February 20, 2018, at 18:28.